The name "Kettleborough" comes from the moniker of the original settlement of the area where the cidery is now located. Kettleborough was inhabited by the LeFevre family whose descendants still live in the New Paltz area. The old Kettleborough School House still stands adjacent to the orchard that has since been planted on their land. 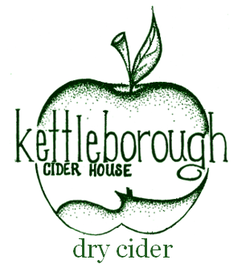 Kettleborough Cider House was founded in 2011 by Tim Dressel. The Dressel Family has been growing apples in New Paltz for four generations, beginning with Fred Dressel in 1923. After graduating from Cornell University in 2007, Tim returned to the family business and still works there full-time. Kettleborough Cider House was born out of his love of horticulture, farm business, and oenology (wine-making). Coming from our apple-growing heritage, we know that great hard cider begins with great apples. Therefore, we have begun planting nearly-extinct varieties of apples that are more suited for hard cider production then your run-of-the-mill grocery store varieties. Hard cider is currently the fastest-growing sector of alcoholic beverages in the United States and Kettleborough is helping lead the charge. Helping with this revival is the resurgence of traditional hard cider apple varieties. Much of the orchard land in colonial America was dedicated to apples that were meant to be made into hard cider, not eaten. When Prohibition took hold in the 1920's, these orchards became useless and were replaced with eating apples or destroyed entirely. Until recently, cider varieties remained virtually extinct in the US and American hard cider has been made from "dessert apples," (or, even worse, apple juice concentrate) usually with the resulting beverage being a bland, sweet, highly-carbonated, "alcoholic apple juice." Unfortunately, these brands have dominated the market and convinced many people that they don't like hard cider. The craft cider movement is looking to change that. With the rising popularity of our Founding Fathers' favorite drink, many producers have begun seeking out the bittersweet and bittersharp apples that once made it so desirable. Kettleborough Cider House is one of the proud few cideries in the region that has planted and harvested these ancient apples. With sixteen European varieties (such as Somerset Red Streak) and four heirloom American varieties (like Esopus Spitzenburg), we are on the leading edge of bringing back the unique, complex, and downright delicious beverage our ancestors knew and loved. The Dressels have been growing apples in New Paltz for more than 90 years and now harvest 150,000 bushels of apples off of 350+ acres every fall. Four generations of apple know-how and a strong, established orchard set us apart from other cider makers. Every apple that goes into our cider was grown on Dressel soil within 3 miles of where it was pressed. In addition to 20+ "dessert" varieties, we also grow 20 varieties devoted entirely to hard cider. Read more about these amazing apples on the "Our Orchard" page. We began producing small-batch hard cider in the summer of 2012. While we continue perfect our trade and expand our business, our production remains extremely small and therefore our ciders are only available locally in the New Paltz, NY area. If you're in the Hudson Valley and your favorite beer or wine store does not carry Kettleborough, be sure to ask for it by name! Our flagship cider. Dry Cider is a departure from sweeter run-of-the-mill hard ciders that have always dominated the market. Our Dry Cider is made from a blend of Northern Spy and Granny Smith apples to create a balanced acidity and fresh green apple flavor. Think "Dry Apple Prosecco." It pairs well with many foods, especially white meats, cheeses, fruits and especially any spice-forward dishes. Apple Mimosa: A crowd favorite! Mix equal parts Kettleborough Dry Cider and Dressel Farms sweet apple cider in a glass. Adjust ratio to taste. Serve immediately. Our latest release! Made with nothing but whole fruit! "Strawberry Cider" begins as a dry hard cider that is infused with hand-pressed Dressel Farms strawberries. Unfiltered and bottle-conditioned, the result is a naturally-sparkling, off-dry cider with a subtle yet satisfying strawberry tint. Our first cider. Currently discontinued due to unfair federal excise tax laws. Brut cider was a higher-alcohol cider made in a dry champagne style from Ida Red, Northern Spy and Empire apples. At 8% alcohol it was a unique cider with a bright, ripe flavor and impressive softness. It finished clean and crisp with just a hint of red-apple sweetness. We miss it and will make it again as soon as the CIDER Act is passed. Click here to learn more about the CIDER Act.